50 customers have given this product a 5-star rating. Of these, 49 customers have written no texts or given their feedback in another language. 27 customers have given this product a 4-star rating. Does just what it says. Keeps 1 or 2 pairs of sticks/beaters etc handy to grab at. 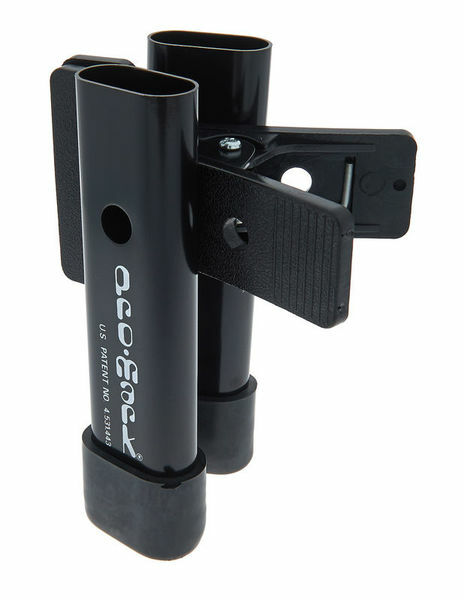 Clamps to any stand on the kit or music stand etc. I sometimes use 2 of these, one each side of the kit somewhere, so when playing shows and into some heavy reading and I don't have time look around for sticks, I know they will be there. Perfect. Easy to attach and detach. It stays close to almost every barrel. Small minus volume. With thick 2B caps, the rack can not fit as many as two pieces. So if you wanna play the gig more then you should take one rack on both sides. ID: 135519 © 1996–2019 Thomann GmbH Thomann loves you, because you rock!